Tagged with " 3D-Drucker Zubehör"
James McVay is a Mechatronics Engineer from Wellington, New Zealand, who’s earned his Masters of Mechatronics Engineering. Anyone who has worked with a 3D printer understands the struggle of dealing with watching a print suddenly and without warning fail right before your eyes. Be it a slightly out of alignment axis, incorrect printing temperature, flawed g code or the looming and inevitable filament jam in the hot end, it is never fun watching hours of work explode into a mess of wasted filament. Not only is your time valuable, but let’s be real, 3D printing filament is not cheap. This is an introduction video of the OPAM (One Piece All Metal) Hot End. It is designed to extrude 3D filaments at temperatures of up to 350°C. It is capable of printing ABS, PLA, PC-ABS and much more! Now available as a retrofit option for existing 3D printers for just £165 (~$250). The recent launch of new multi-material upgrades for existing 3D printers has enabled us to make our proprietary technology as a retrofit option for existing 3D printers. The kit is available for the Rostock Max v1 is available now. Additional development and testing is required for before we launch kits for other popular Cartesian and Delta printers, so these will follow in a separate Kickstarter later this summer. Please let us know your printer type if you would be interested in adding fully functioning product assembly to your printer. An Adjustable Resolution 3D Print Head? Peter Mann and Nick McGibbon are a design and prototyping team with extensive backgrounds in CAD, materials testing, application manufacturing, product design, 3D milling and 3D printing, and they’ve created the xHead Extruder, what they call the world’s first adjustable resolution print head. The World’s First Adjustable Resolution Print Head! The xHead was designed to address specific problems associated with 3d printing. Namely, the hassle of fixed resolutions, head cleaning, clogged nozzles and messy tape on the heater block. Rather then waste time complaining, we simply decided to solve the issues we raised. From the initial concept to the first prototype, the xHead surpassed both our expectations. We were so happy with the results, we immediately filed a provisional patent for our invention. For many of us who own a 3D printer, the monotone objects which we fabricate on a daily basis may begin to appear a bit boring. 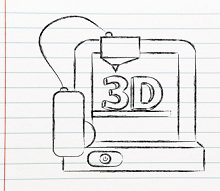 Every day, new machines enter the market, many equipped with two, three, or even four extruders, enabling users to print objects in multiple colors. Where does this leave those of us who recently purchased a single extrusion 3D printer? Well, sometimes a bit jealous. We’ve seen 3D printers become easier to use, more affordable, and more accessible; but the range of objects they can create has remained the same. No one has taken these printers to the next level… until now. It’s a rare individual not drawn to the rich allure of gold. Our need and constant quest for the treasured metal has manifested itself in nearly every part of the world and is responsible for causing economies to soar, and tumble. It’s an interest and obsession that has been part of the human paradigm since the earliest empires of man. Orbit1 is an efficient, easy to use electroplating device that coats almost anything in metal, at only $2/g. Orbit1 is an electroplater that allows you to plate just about everything. Look at the trumpet we 3D printed and plated with Orbit1! You can even make your own musical instrument at home. Using Orbit1, you can coat your works in metal, even gold, in three simple steps. First, clean and polish your object, next spray the conductive paint, then click start. Orbit1 will metallize your design, empowering you with the Midas touch from your tabletop. Orbit1 is a step forward in the 3D printing world. Earlier this week, we released a list of what we feel are among the top 10 affordable desktop 3D printers available at this time. Coming in at #4 on the list was the Printrbot Metal Simple, a creation by Brook Drumm and company which has received rave reviews from the 3D printing community. A step above the $599 Metal Simple, for those of you with larger wallets or pocketbooks, is the Printrbot Metal Plus. This machine has an even larger build envelope of 10 x 10 x 10 inches while maintaining the same sturdy feel and precise print capabilities of the smaller predecessor. Nach der veröffentlichung unseres GRANULAT-EXTRUDER/HOTENDS GEH1.0, haben wir auch einige Verbesserungs-Tipps erhalten die wir sofort umsetzen wollten und daraus entstand nun die Version – GEH2.0. – und wird durch einen Einfüllstutzen gefüllt, damit unendlich großer Auffülltank denkbar. IHR ERHALTET AUCH ALLE BAUZEICHUNGEN, DETAILS, QUELLENANGABEN und alle STL-FILES – KOSTENLOS ZUGESENDET! When it comes to 3D printers, one of the most important, as well as expensive components on any FFF or FDM machine is the hotend. After all, the hotend is what transforms your filament into the molten hot plastic as it is released onto the build platform. A faulty hotend equates to terrible print results.